Why do we call this shirt perfect? It’s the basic wardrobe staple for the confident and comfortable woman. We like to leave the optional necktie hanging free for the nonchalant glam rock look. This shirt is the ultimate in versatility - wear it loosely buttoned sans the tie with sleeves rolled up for a casual look or completely buttoned and tied - Madame Secretary style. Either way, the drape of the fabric implies a woman who knows what she wants. Loving it with denim. Looks beautiful under a blazer too. 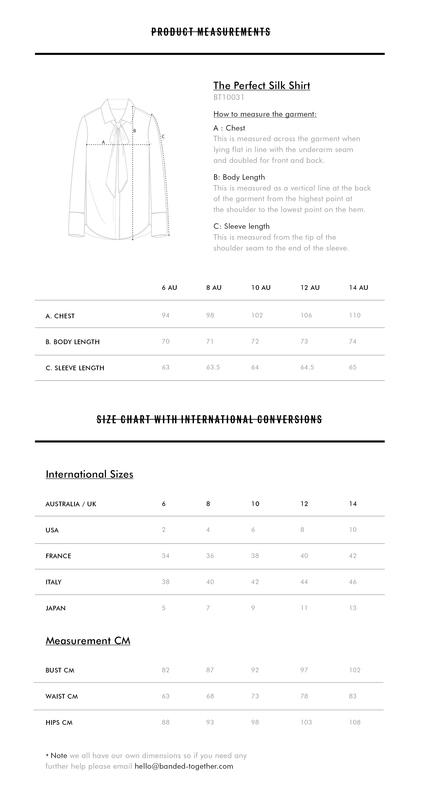 Fits true to size but if you are larger in the chest and inbetween sizes go up a size. Slim fitting across the shoulders and bust - falls loosely over the body in an A line shape.